Further topics included are: biotechnological production of monomers for chemical polymer synthesis, conversion of raw materials, corrosion, composting, environmental impacts, health issues, legal, ecological and economic aspects. Alexander Steinbuchel has been Full Professor of Microbiology and Director of the Institute for Microbiology at the University of Munster since 1994. After his PhD in 1983 he spent one year at the Rockefeller University New York and in 1992 he received the Philip Morris Research Award. Alexander Steinbuchel has over 250 publications to his name and has organized several symposia focusing on biopolymers. Applications of Natural Fiber Composites for Constructive Parts in Aerospace, Automobiles, and Other Areas (U. Riedel & J. Nickel). Applications of Biopolymers in Construction Engineering (J. Plank). Microbial Deterioration of Synthetic and Biological Polymers Used in Engineering and Construction (J. Gu). Applications of Polyphosphate and other Biopolymers in Wastewater Treatment (A. Kuroda & H. Ohtake). Mater-Bi: Biodegradable Material for Various Applications (C. Bastioli). Chemical Modification of Synthetic and Biosynthetic Polyesters (B. Hazer). Biofilms (H. Flemming & J. Wingender). 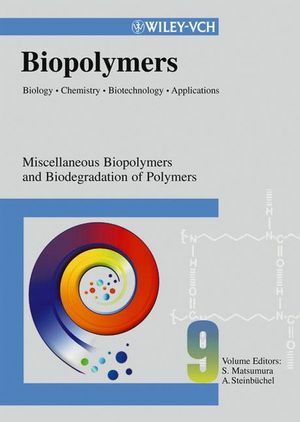 Health Issues of Biopolymers: Polyhydroxybutyrate (T. Freier, et al.). Biotechnological Processes for the Production of Monomers for Subsequent Chemical Polymer Synthesis (S. Lee, et al.). 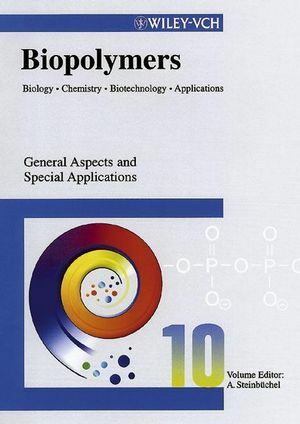 Economic Aspects of Biopolymer Production (S. Lee, et al.). Sustainability, Agro-resources and Technology in the Polymer Industry (S. Vellema, et al.). Biodegradability of Polymers: Regulations and Methods for Testing (R. M 2;ller). Evaluation and Certification of Compostable Polymeric Materials and Products (M. van der Zee). Life-cycle Assessment of Bio-based Polymers and Natural Fiber Composites (M. Patel, et al.). Biodegradable Plastics in the Social and Political Environment (I. Sartorius). Evaluating the Environmental Impact of Biopolymers (S. Slater, et al. ).